“Perhaps the most remarkable Gecko of the South African geckoes is the web-footed Palmatogecko from the Namib desert.“ Brain (1958) formulated it very accurately in his description of one of the characteristic species from Namibia’s coastal deserts. Even though P. rangei counts among the well known species it is still a rare sight in our terrariums. Sometimes this species is considered to be delicate and hard to keep. 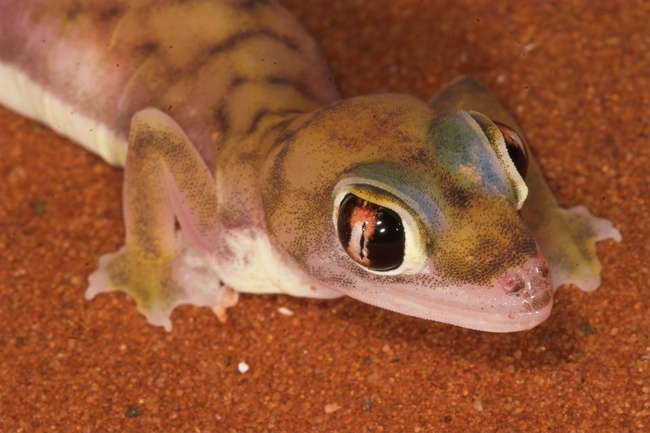 However, if one understands the particular needs of this specialized gecko and provides the appropriate conditions it’s more than likely to be kept and bred successfully. The “web footed gecko” was described in 1908 by the Swedish Herpetologist Lars Gabriel Andersson. He named the species in honor of the collector P. Range who found this type of specimen in Lüderitz, Namibia. The Genus name refers most likely to palma, the Latin word for palm. Up to the nineties of the last century the species kept that scientific name, which leads to the fact that among gecko keepers “Palmatogecko” is widely accepted as a common name. Since 2005 rangei, as well as the closely related sister taxon vanzyli has been a member of the collective genus Pachydactylus, where both form the so called Palmatogecko group within the genus (Bauer & Lamb 2005). Web footed geckos are small lizards. According to Haacke (1976) the bigger females reach a total length of up to 5.5 inches. Our adults stay somewhat smaller with the females reaching lengths of about 4.9 inches and weighing up to 10 grams. The slightly shorter males reach lengths of 4.3 inches but only weigh about 5 to 6 grams. Beside the amazing eyes and the unusual semitransparent skin the webbed feet certainly are the most remarkable aspect of this species. Only three species worldwide developed webbed feet: the sister taxon P. vanzyli and Stenodactylus arabicus from the Arabian Peninsula. 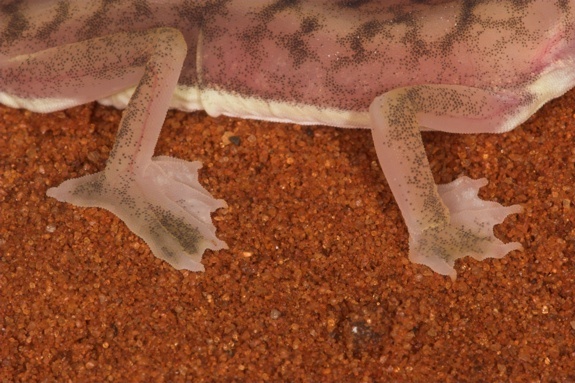 Russel & Bauer (1990) examined the burrowing behavior of rangei and noticed that this special shape of the feet suits perfectly for burrowing in loose sand. The web-foot doesn’t act as a snowshoe, as it was believed for a long time, but as a shovel. 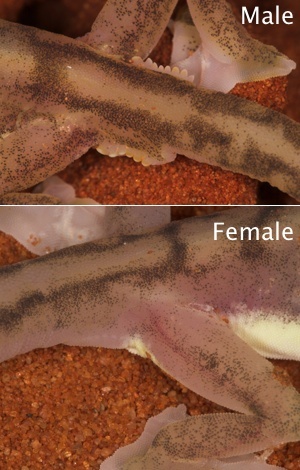 They found out that due to special muscles and tendons the geckos are capable of forming a shovel by turning their toes. 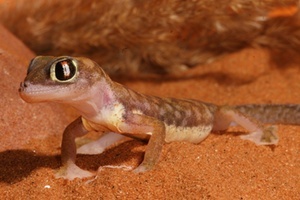 Due to a complex movement interaction between front and back legs, sand will be transported behind the gecko very efficiently while burrowing in the very loose dune sand. The following piece of information is from Haacke (1976), if not mentioned otherwise. This species occurs along the southwest African coast from Mocamedes, Angola in the north to Daberas in the Richtersveld area in South Africa. The major part of the population probably inhabits the wide coastal deserts of Namibia, between the Koichab and the Kuiseb river. There is one documentation reporting that the distribution can stretch inland for about 80 miles (Koch 1962). As Namibia’s coastal desert is a very harsh environment with almost no precipitation and very high temperatures, the geckos have to spend the whole day secluded in their burrows. Below the surface, temperatures are much more stable compared to the huge fluctuation above the ground. According to the comprehensive studies of the Namibian climate by Lancaster et al. (1984) the temperature above the ground varies from 33.8 to 109.04° Fahrenheit throughout the year. Below the surface, however, temperatures are much more stable. About one foot below the ground, the temperatures only vary between 70 and 90° Fahrenheit throughout the year. On average the annual precipitation is about 2.36 inches, but only 1.07 inches of it is caused by rain; the rest is fog. Due to complex meteorological phenomena (cold sea, hot coast etc.) heavy fogs often arise at night. These fogs are the key factor for life itself in the coastal deserts. Considering the information about ecology it is clear that one has to provide an arid environment, fine loose sand and very delicate humidity management. However it is not as difficult as it might seem. We usually keep our adults in shoe boxes with a ground area of about 15 x 11 inches. Those boxes are filled with fine sand up to 1 to 2 inches. The sand must be round-cornered natural sand, not industrially produced broken sand. It has to be absolutely free of loam and clay particles and must not clump together when drying after having been watered. We use commercially available desert sand, but beach sand should work fine, too. The geckos will dig their own burrows, but will also use additional hiding places such as plastic saucers placed upside down onto the sand. For humidity it is necessary to spray water onto the sand and under the hiding spots once a day. It should be enough to wet the sand slightly, but it has to be so little that the whole surface will dry out during the day. Therefore high ventilation is mandatory. As the geckos are absolutely unable to climb, we recommend using no lid at all as this will provide the best ventilation. We use heating cables as under-tank heating. About one third of the ground space is heated up to 95° Fahrenheit. This will lead to a horizontal temperature gradient and allows the geckos to choose the preferred temperatures. Rangei are voracious feeders, although they are not the best hunters. We feed mainly crickets of appropriate size (not too big) and offer small dubia roaches from time to time. For rearing hatchlings you need pinhead crickets and the much recommended firebrats (Thermobia domestica). An interesting fact about rangei is that there is absolutely no aggression among males. So it is safe and in our opinion even recommended to keep several males and females together in one enclosure. Our breeding groups usually consist of 3 males and 3 to 5 females. The sexes are easily distinguished by spurs at the side of the tail. Males clearly show a row of 7 – 11 spurs, enlarged spiny looking scales. Females also have these spurs, but theirs are much smaller and rather undifferentiated. At the age of about three months the geckos are big enough to be sexed by an experienced breeder. Sexual maturity usually is reached at the age of nine months, even though we have had females producing unfertilized eggs as early as 6 months after hatching. We recommend separating sexes until they are one year old to avoid gravidity in juveniles. To synchronize sexes and to induce breeding behavior one should provide a pseudo hibernation for about two months. During this time temperatures should vary between 65 and 70° Fahrenheit. The geckos will become quite inactive and will not feed much. It’s not necessary to separate sexes during hibernation. After bringing the temperatures back to the usual level they will start breeding. A few weeks later eggs will be clearly visible through the semitransparent skin. Eggs will be buried in the sand and covered carefully. It is highly recommended watching out for gravid females to recognize when they have laid their eggs. Then you have to dig for those very carefully. The eggs are extremely fragile and break easily. Once you find the eggs, they should be placed on dry sand in an incubation box. The eggs should remain dry, but the air humidity should be high. This can be done by the box in box method. That means one box contains dry sand on which the eggs are placed. The other box contains wet substrate. Incubation temperatures should be around 86° Fahrenheit. 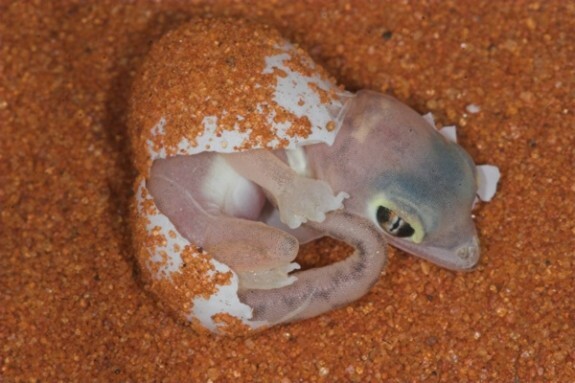 After two and a half months hatchlings will emerge from the eggs and shed immediately. They should be kept the same way as the adults and can be reared in groups. Two days after hatching they start feeding. 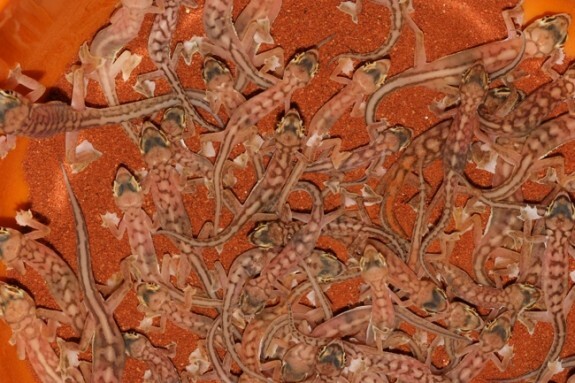 Very small crickets and especially firebrats are ideal food for hatchlings. You need to feed enough to ensure each one will get enough food but not too much as too many feeder insects can stress the hatchlings. Once established they grow quite fast and will not cause any problems. Andersson, L.G. (1908): A remarkable new Gecko from South-Africa and a new Stenocercus-species from South-America in the Natural Museum in Wiesbaden. – Jahrbücher des Nassauischen Vereins für Naturkunde, 61: 299–306. Brain, C.K. (1958): Web-footed Geckos of the Namib (Palmatogecko rangei Andersson.). – African Wildlife 12: 67–70. Hacke, W.D. (1976): The burrowing geckos of Southern Africa, 2. – Annals of the Transvaal Museum 30: 13–29. Koch, C. (1962): The Tenebrionidae of Southern Africa XXXI. Comprehensive notes on the Tenebrionid fauna of the Namib Desert. – Annals of the Transvaal Museum 24: 61–106. Lancaster, J., N. Lancaster & M.K. Seely (1984): Climate of the central Namib Desert. – Madoqua 14(1): 5–61. Russel, A.P. & A.M. Bauer (1990): Substrate excavation in the Namibian web-footed gecko, Palmatogecko rangei Andersson 1908, and its ecological significance. – Tropical Zoology 3: 197–207. Hi:- Thank you for your interesting article on the Namib Web-footed Gecko. I really like their eyes. They truly are amazing. hi, so i am wanting a gecko and never had one befor i really want one of theys do they cost alot? I’m the editor, not the author (who may reply himself) but I can say that the Palmetto geckos I know of are selling for $400/pair. If you’ve never had a gecko before, I’d recommend starting with a beginner species like a leopard gecko or crested gecko since the geckos in this article are more challenging to care for. Your best bet is to google “P. rangeii for sale” and see what you find. You can also check out faunaclassified.com in the “other geckos” classified section and I think you can put in a “wanted” ad there as well.